SAGITA COM - Master ISO Windows XP Super Glass 2014 Adalah master Iso Windows Xp Sp3 yang sudah di modifikasi sedemikian rupa. 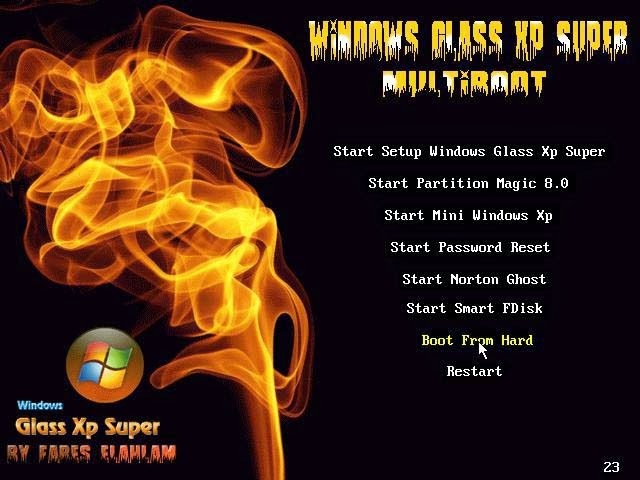 Pada windows Xp Super Glass ini ada beberapa software yang di hilangkan, sehingga akan meminimalisir sebagian bug error. Di lihat dari tampilan transparansi windows ini sangat memukau pemakainya, Ini sangat cocok bagi Anda yang gemar dengan tampilan windows yang modern. Di dalam windows ini juga sudah di integrasikan beberapa software yang mungkin Anda butuhkan, jika tidak, Anda bisa memilih software mana saja yang Anda kehendaki, dan sudah dilengkapi dengan menu boot, jika anda penasaran silahkan saja langsung di download ! has been deleted some languages ​​and not all. has been deleted backgrounds old. has been deleted the voices of Windows older. has been deleted old games and online games. has been deleted the definition of the printer to its large size. has been added to the definitions Lan _ Chipset _ Cpu. has been added to the definitions SATA to accept modern equipment and laptops. has been added to Internet Explorer 8 and Windows Media Player 11, the last updates. added 17 Theme transparent glass in the very beauty. has been added to a group of tillers beautiful, high-quality HD. added 10 new games and fun instead of old games. added new sounds for Windows instead of the traditional sounds of the XP. has been added to a range of new tools for the control panels. has been added to a group of lines Arabic and English, the beautiful. has been added to set a new photo of the user. has been added to the cylinder programs with a range of important programs for any user. has been added to a group of ÇáŃíĚÓĘŃě and additions important that given the speed and also the form of Jamali version. has been added to group tools as the Super Tools in Start menu down the list of Games. has been changed all the icons and images almost Baloyndoz for noticing a difference in the version of the form Jamali. have been additions icons and mouse pointers new. has been added to many of the tools in the list of bots such as mini and Windows Albartchen Magic and Norton Ghost.